If you are headed out to "Sin City" with a large group or just want to make a lasting memory for you and your friends, then there is no other way to roll down Las Vegas Blvd than in Vegas VIP's H2 Hummer Stretch SUV limousine. This large limo makes a statement and has all the features to match. The Hummer boasts long, leather bench seating, DVD and TV's, CD player, AM/FM stereo with premium Bose sound system quality. The H2 limo also has a bar with cup holders and ice boxes to handle the party crowd and champagne glasses and mood lighting throughout for more private excursions. The rugged Hummer H2 chassis is stretched to accommodate 18 to 20 passengers in comfort and is sure to turn heads as it pulls up to your hotel's valet. 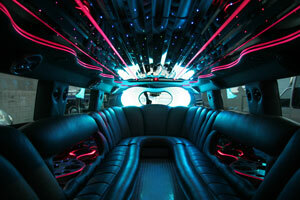 Vegas VIP has the most professional and knowledgeable drivers in Las Vegas. Our courteous drivers will be there to get you where you need to go and have the experience to handle this beast on four wheels. Cruising down the strip takes on a completely new meaning when you are riding in a vehicle like our stretch Hummer H2 limousine! You could charter the H2 limo and go from the south strip by the world famous Las Vegas Sign all the way up Las Vegas Blvd past the Fountains at Bellagio and end up in old Downtown Las Vegas, all the while partying with your 18 closest friends. Imagine the possibilities! 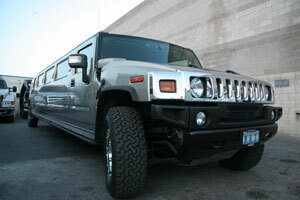 Vegas VIP has the cleanest, newest Hummer H2 limousines in Las Vegas and we offer a variety of colors. This is one of the most popular and sought after cars on Las Vegas Blvd. Be sure to call and make arrangements to charter the H2 Hummer Stretch SUV limo for your event early, as charters sell out quickly for this popular party machine. Call now toll free at 1-800-VEGASVIP for the ride of your life!